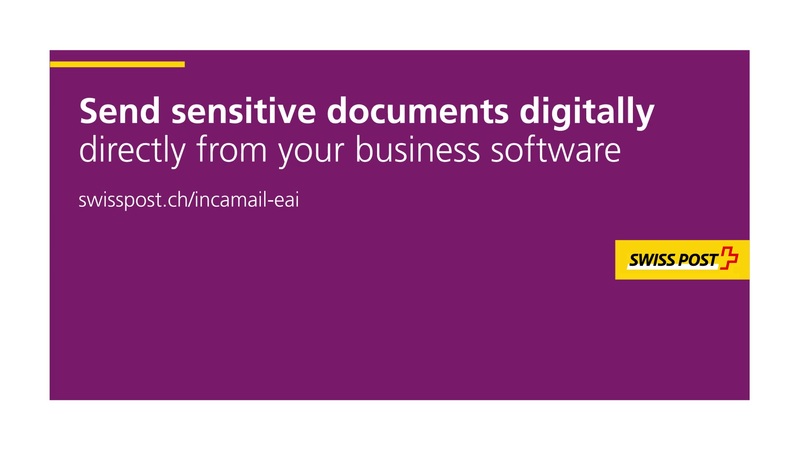 IncaMail enables you to send sensitive information such as tax assessment notices, court rulings and payslips in an encrypted and traceable format. Directly and simply via your own business software. A single click in the software is all you need to reach any e-mail address anywhere in the world. Thanks to its flexible interfaces, it is very easy to connect IncaMail to your business software. This enables sensitive documents to be sent directly via your application in an encrypted format. A single mouse click in the business software is all you need to send the personalized documents created by the application together with a message to any recipient anywhere in the world. Your recipient will then receive an e-mail electronically signed by Swiss Post. This contains your message together with the associated documents as an encrypted attachment. The recipient opens this message in their personal mailbox (e.g. in Gmail, Bluewin, etc.) using their IncaMail password. IncaMail does not save message contents. Third parties have no means of reading the content of messages. IncaMail meets all EU and Swiss compliance requirements for contract data processing. IncaMail is officially recognized by the Swiss Federal Department of Justice and Police as a secure delivery platform. Numerous companies from a range of different sectors worldwide enjoy secure, traceable communication with IncaMail. The distribution of payrolls in companies is often a cost-driving and time-consuming process. By rolling out smahrt-eDoc and IncaMail, Swiss Post’s secure e-mail service, Alfred Kärcher GmbH & Co. KG will in future be able to complete these tasks more quickly, inexpensively and securely. A yellow Swiss Post flyer gave Qualipet the impetus to haul the dispatch of payroll documents into the digital age. At a glance, it contained all the advantages provided by the IncaMail e-mail service: quick and secure delivery at the touch of a button. The customer pays a one-off setup price for the activation of IncaMail. The setup price is based on the number of employees and includes the entire documentation and the setup of a sender e-mail address in IncaMail. The concrete implementation of the integration in the business software and the associated costs are the responsibility of the customer or the respective business software partner. The customer pays a price per transaction. Invoicing is done quarterly. The customer chooses between the free support package “Self Service” and the support package “Care”, which has to be paid for. With the use of the SOAP interface for integration into business software it is possible to import IncaMail messages directly into this. With the “poste restante” option we offer the possibility to retrieve received IncaMail messages with the software during a maximum period of 7 days on our server. This option is activated individually per IncaMail account (max. 100 MB) and is available only for the SOAP interface. If messages are not retrieved within 7 days, these will be deleted. The price for this option is CHF 990.00 (or EUR 900.00) per year and activated e-mail address. The option “Poste restante” cannot currently be purchased online, please contact us. Purchase IncaMail for your business software directly online. Once your contract of sale has been concluded, we will contact you in order to activate the service.